A free sample of Super Cedar Firestarters was delivered to our front porch. This product is a great tool to start a barbeque or wood fire. The company claims; "Super Cedar Firestarters manufactures and distributes an environmentally safe clean and fast way to start your fire every time!". 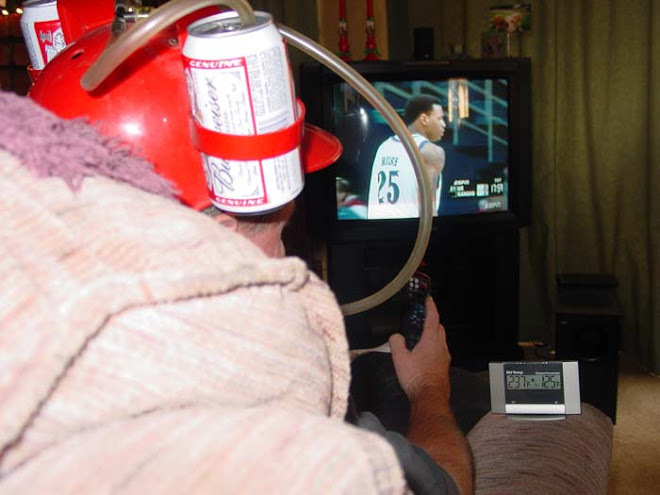 This may be just what the doctor ordered. As we ever needed an excuse to have a barbeque, it just so happens we wanted to cook some buffalo burgers. I cut the starter puck into quarters. A chimney charcoal starter was filled with fuel and a match was struck to light this 1/4 of a hockey puck. Super Cedar Firestarter ignited with ease. A quick and strong flame leaped from this product. Super Cedar Firestarter worked as advertised. The burgers were cooked and not even a hint of starter was tasted.One unique feature of this product is that you can have your own labels printed to cover this product. Instead of business cards I could hand out Mad Meat Genius fire starters. I think I may take a nap on this one. 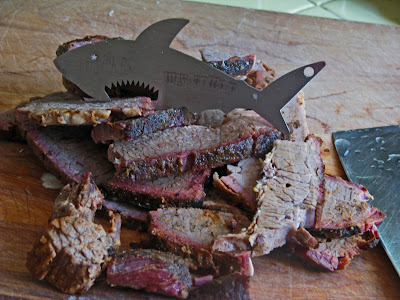 Burnt ends are the point end of a brisket that have been cooked to the stage of being covered in a dark flavorful bark. They have been referred to as meat candy.We cooked with brisket today but the results were not sweet meat chunks, but more like charcoal. We attempted to make a meat pie using leftover brisket and vegetables. This pie was covered with a simple pie crust. 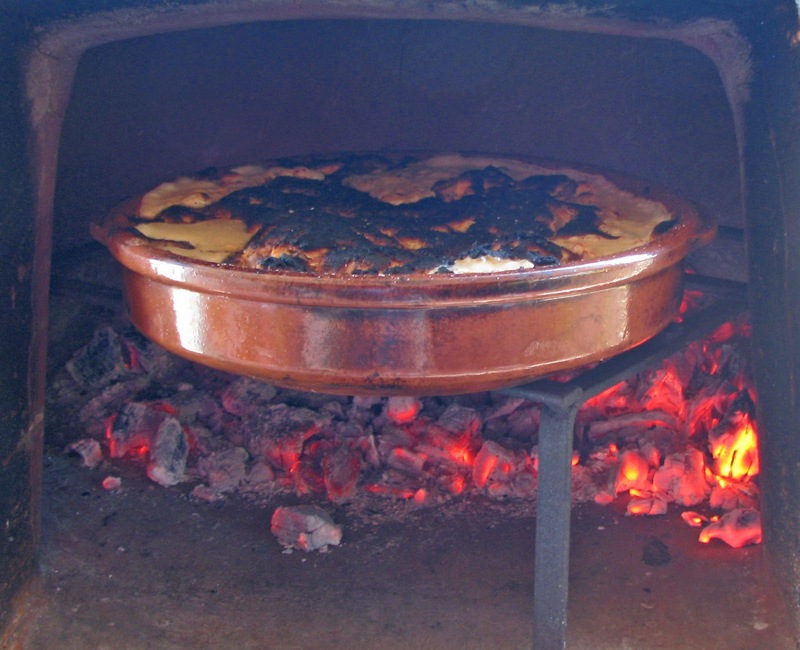 The wood fired oven was stoked and the pie was cooked in a excessive high level of heat. The ingredients of this pie was a melody of beautiful parts. Some smoky leftover brisket, carrots, potato's, and mushrooms. were place in a aluminum pan with a splash of water. It was covered with foil and cooked in the oven for 10 minutes. The high heat steamed the vegetables perfectly. 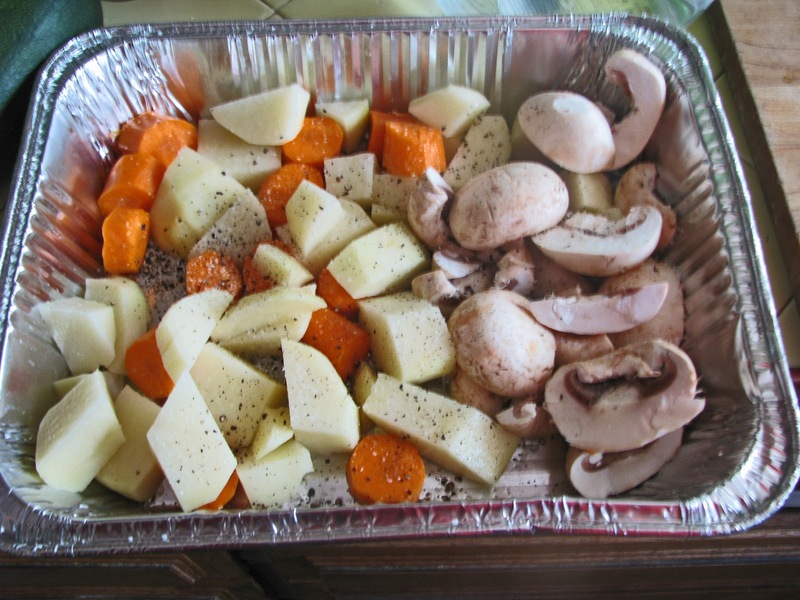 Chopped meat and seasonings were added to the vegetables. Some cream of mushroom soup was added to this mixture. The filling was covered with a simple pie crust. The wood fired oven is a fun tool. I have been guilty in the past of using to high a level of heat.There is a calming effect building a fire and watching it burn. I need to be patient and let the heat come down from 900 degrees. Maybe it is the heat of my passion of burning desire to cook some great meals. Any way, the crust burned almost immediately. The meal was not a total loss. We just removed the crust and enjoyed the filling. Sometimes burnt endings are okay! One tries to eat a balanced diet of fruits, vegetables, grains, protein and of course bacon. We have been exercising regularly. The garden is starting to produce a bounty of vegetables. 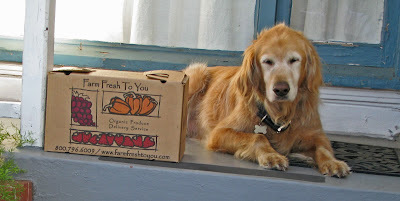 We just finished our box of organic produce “Dagnabbit”, sometimes you just want to eat some fried food. We went to the food court at the State Fair and were not satisfied. 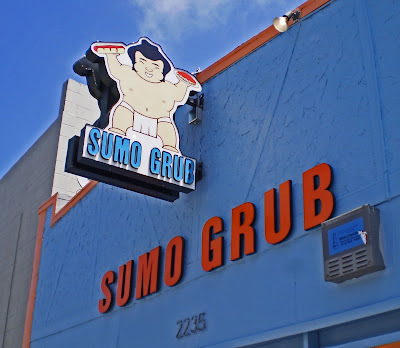 We will have to take a visit to ‘Sumo Grub’. We drove to the Meathenge lab to pick up the famous Doctor Biggles. We wanted him to come along in case we experienced “Grease Overload Syndrome” and also because he has a neat camera.. Sumo Grub is located across the street from Berkeley High School. This may explain the menu and extremely low prices. 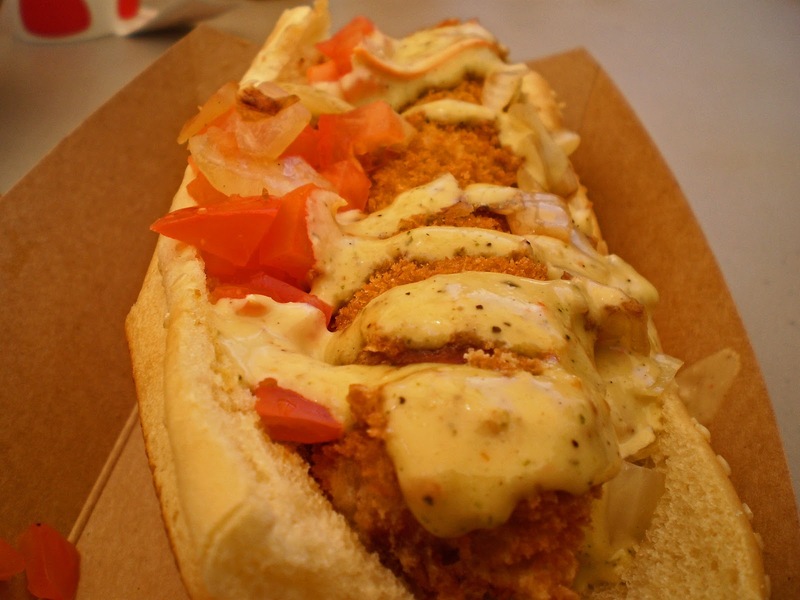 Sumo Grub has an extensive list of food that is deep-fried. There are hamburgers and meat/rice dishes and maybe a few salads but the deep fryer gets a hefty work out. We bellied up to the counter and placed an order that possibly will guarantee artery failure. My death wish list order included deep fried pizza, deep-fried macaroni and cheese, and a deep-fried chicken apple sausage sandwich. Ms. Goofy played it safe by requesting a burger and some killer deep fried onion rings. The dough of the deep fried pizza was house made. The dough was covered with tomato sauce and cheese then dipped in a panko style crust and submerged in bubbling oil. It was covered in ‘Sumo Sauce which is a mayonnaise/basil/sweet/tart slurry. 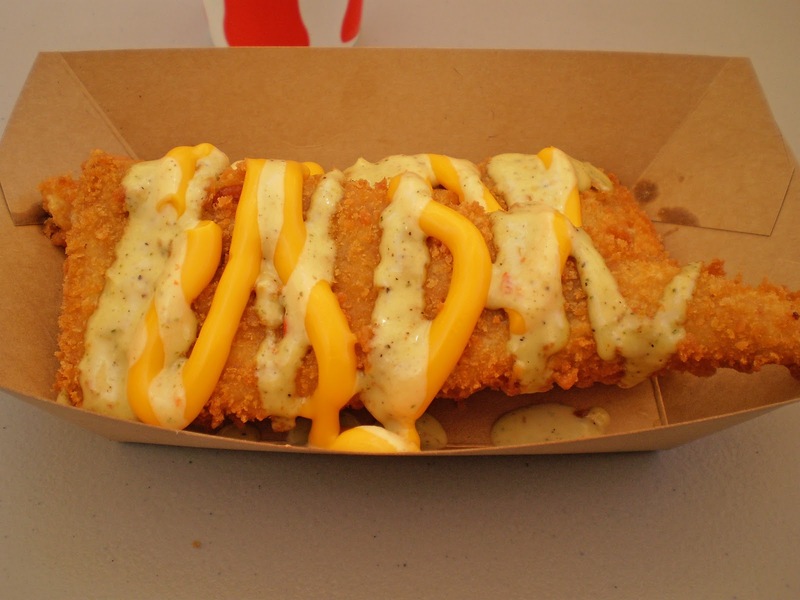 The deep-fried macaroni and cheese was gooey, oozy, cheesy and crisp all at the same time. It also was garnished with Sumo sauce. The chicken apple sausage was savory, sweet, crunchy and of course covered in Sumo Sauce. We had not entered the emergency room yet, so we needed to order dessert. Hang on to your hospital gurney because here comes the “Heart Attack”. 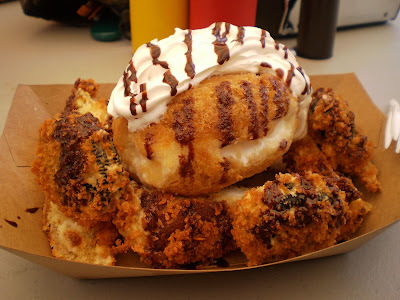 Deep Fried Pineapple/Coconut Ice Cream, Deep Fried Oreo Cookies, Deep Fried Twinkies, Deep Fried Ding-Dongs were all arranged together and covered with chocolate syrup and whipped cream. Yes you have read that correctly. How did all this food taste? Sumo Grub is a clean friendly inexpensive restaurant to get your fry on. We were on a mission to eat fried food. Mission accomplished! As soon as I got home , I had to take a nap.. Ms. Goofy would like to give her opinion of Sumo Grub. Sometimes words are not necessary. Sometimes you will find a food treat in the most unexpected of places. As you may know we have been searching for the ultimate plate of chile verde. 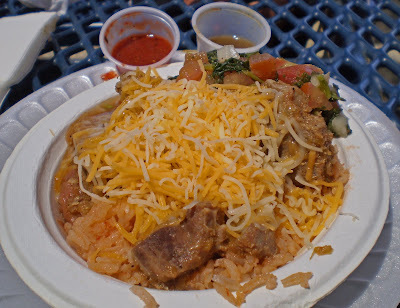 We just so happened to find possibly the best chile verde ever made, at the California State Fair. We were actually looking for chocolate covered onion rings but "Rose's Mexican Food' booth caught my eye advertising for a 'Chile Verde Bowl'. I plucked down five dollars and fifty cents and received a bowl of verde gold. These pork chunks were tender and flavorfuly kissed with a broth of green chile love. Some rice and beans cooked with the 'All Mighty Lard' provided a perfect vehicle to soak up this green chile gravy. This bowl of green chiles and pork was so delicious a tear came to my eye. I was tempted to order another bowl but we had the rest of the fair to see. 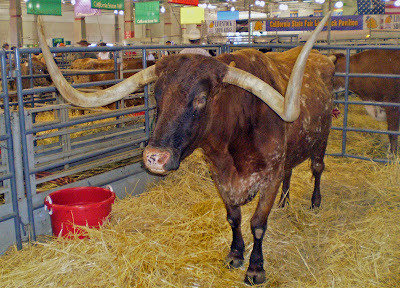 We strolled through the livestock pavilion and spied this longhorn giant. He was impressive. 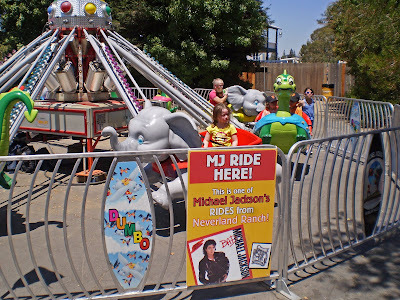 The handlers would not let Ms. Goofy ride him so we found this ride from the Neverland Ranch. With Ms. Goofy being happy we found another food find of jalapeno jerky. It was sold by two naughty ladies from 'Jerrys Cowboy Jerky". They were having a lot of fun. 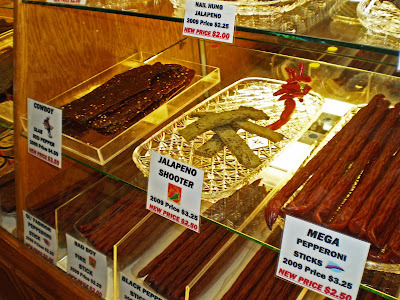 This jerky was a spicy meat stick of jalapeno joy. We hiked through the gardens and needed some more nourishment. 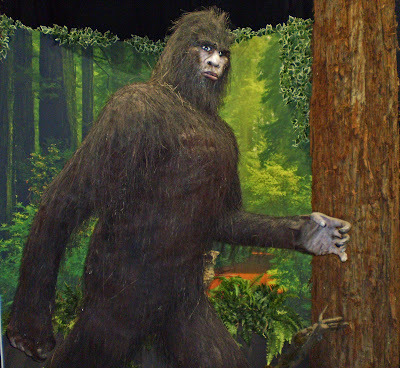 Big Foot chased us all the way back to the food court. Once we safely made it back to the food court, Ms. Goofy bought a corn dog and a fried cheese stick. 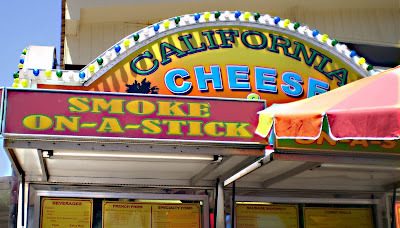 This cheese stick will be classified under the "Don't ask, Don't tell" policy, it was that bad. We never found the chocolate covered onion rings but we do have the memories of the remarkable bowl of chile verde we had earlier. The State Fair runs to August 1, so you have a short window of opportunity to try this outstanding chile verde bowl. You will not be disappointed. 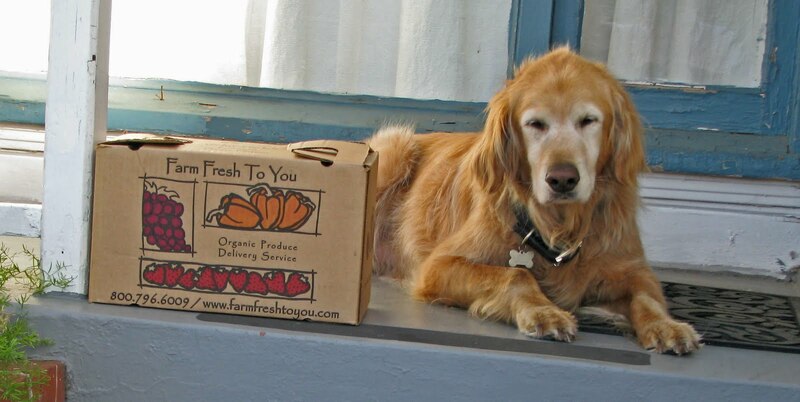 Oscar our 'Golden Retriever Lap' dog and part time vegetable guard tried his best to stay awake while watching over our first shipment of fruits and vegetables. He did his best and his snoring probably scared away any vegetable bandits. We have jumped on the organic home fruit and vegetable home delivery wagon. We have elected to receive a shipment once a month. This shipment will contain all organic fruits and veggies grown from the Capay farm located in northern California. 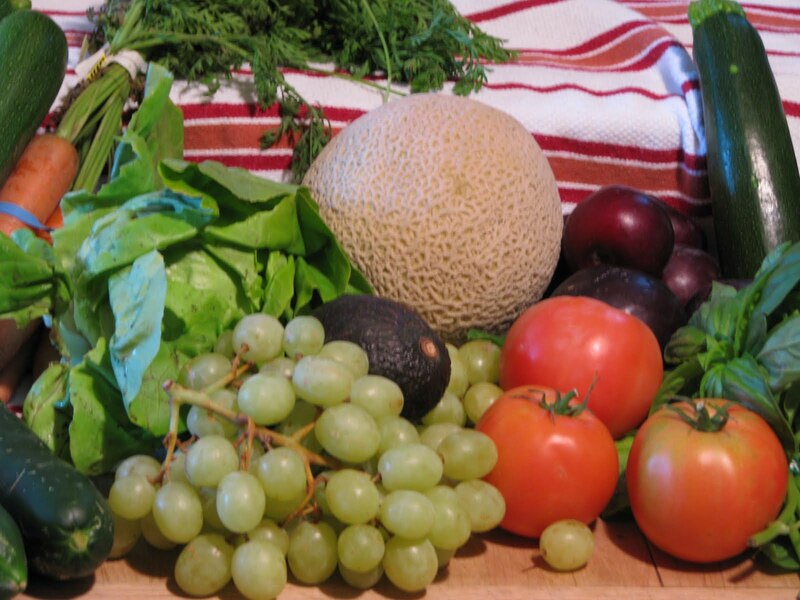 This Community Supported Agriculture company is called 'Farm Fresh to You". This box of produce was packed with a cornucopia of different colored produce. Plums, Cantelope, Avocado, basil, grapes, tomato's, zucchini, cucumber and carrots was the bounty arranged in our box. We are looking forward to creating different ways to incorporate meat into our treasure chest of fresh organic fruits and vegetables. ‘4505 Meats’ is a company whose tag line is ; ‘Producers of all things meaty and tasty with the occasional salad’. They also make a bacon hot dog. This sounds like my kinda company. 4505 Meats sells their meat products on line and at the Ferry Plaza Farmers Market. It was time to take a trip to the City and procure some bacon hot dogs. We arrived at the Bay Bridge toll plaza at 10:02 am and did not have to pay the 2 dollars penalty, “I have a job and have to go to work tax”, so our toll was 4 dollars. We arrived at the Ferry Plaza and found a parking spot right across the street. This was a good omen of things to come. 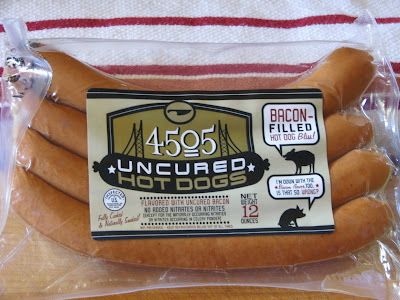 “4505 Uncured Hot Dogs” has a laundry list of ingredients. There is chicken, beef, pork and most important bacon in this meat tube of goodness. The bacon is not cured with conventional nitrates but is cured with celery powder. All this meat nourishment is ground and mixed and stuffed into sheep casings. 4505 Meats runs a stand that sells their products all ready prepared to eat and they also have meats to take home. 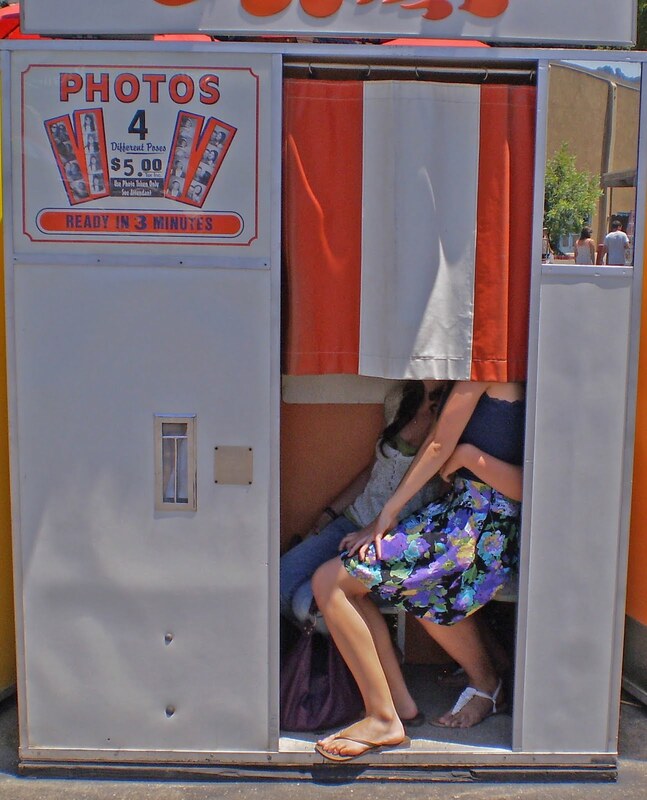 It was quiet the popular booth. Check out their chicharronnes for another porky treat. 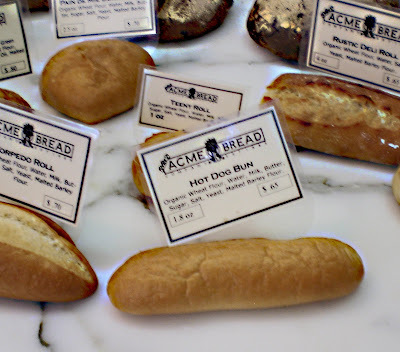 We picked up some smoked jalapeno sauerkraut and some Acme hot dog buns to fill up our shopping cart. We were ready to eat. These dogs have a real snap when you bite into them. They have a wonderful meaty flavor. I am not sure I could really identify a bacon flavor. If I closed my eyes and did not know what brand of dog I was eating, I would say it was a very good quality 'All Beef' hot dog. 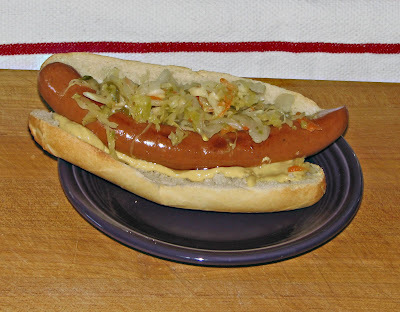 The smoked jalapeno sauerkraut combined with the Acme hot dog bun slathered with mustard made for a salty snappy hot diggity dog treat. These are quality dogs but where’s the bacon? We have a beautiful Chateaubriand that we purchased on our last Meat Adventure from Lawrence's . We are going to barbeque this meat using a new/old technique. Really this cooking method has been around since caveman days. Prehistoric man probably stumbled across a dinosaur 'Kobe-T-Boneasaurus' that had been singed in a natural fire caused by lightning. He consumed the cooked animal and found it was easier to eat and digest. Hence the backyard barbeque is discovered. The backyard may have been a whole forest. Today's forest fire will be contained in a kettle grill. Our fuel will be mesquite charcoal. 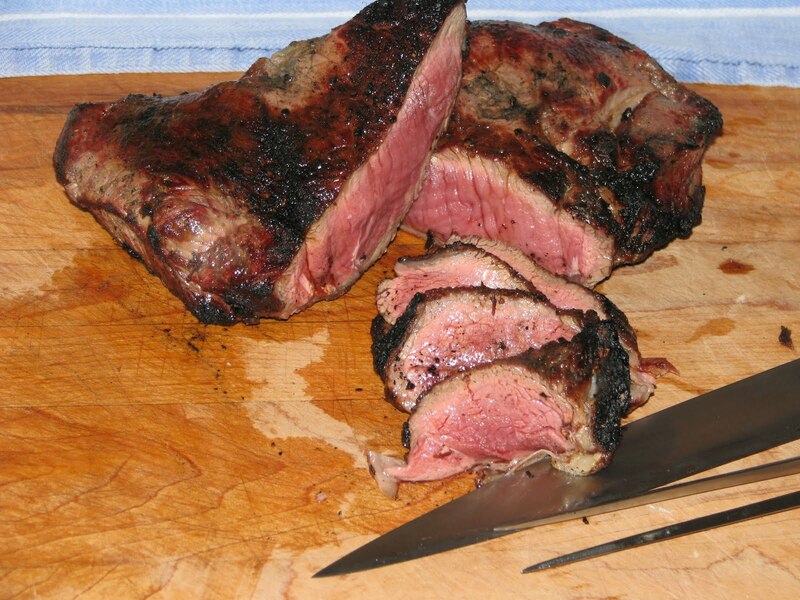 The Chateaubriand will be seasoned with a little salt and pepper. The fire was started in a chimney starter. Be careful using mesquite because it will pop and sputter creating a mini fire works show. 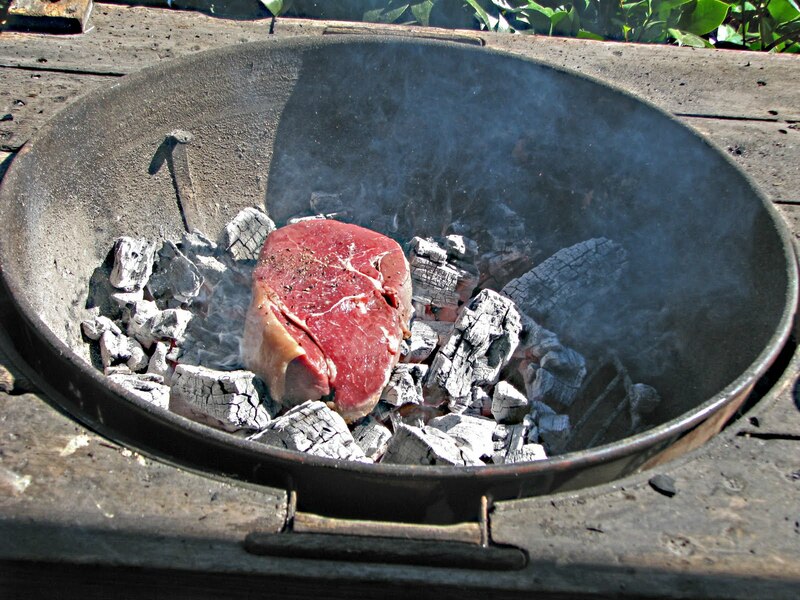 Once your coals are red hot and covered with a little ash rake evenly over bottom of kettle and take a bellows or use a newspaper and fan the fire. This will remove any ash that is on top of the charcoal. 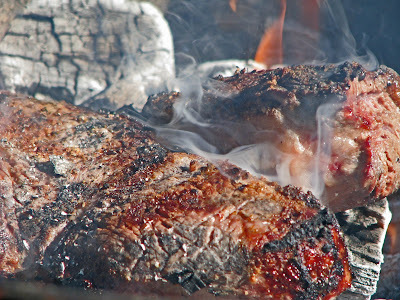 Place your seasoned meat on top of the coals. It gets no easier than this. The fat of the meat will flare into flame and should be extinguished by using the kettle cover. Your cooking times will be a lot shorter. Using gloves and long tongs flip your meat over. 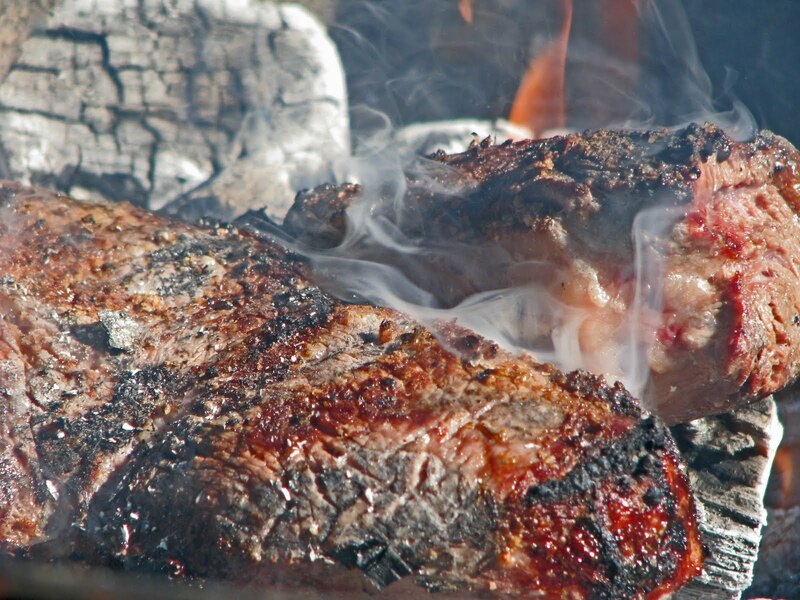 Brush any charcoal that sticks to your meat off with your tongs. This cut of meat was cooked 4 minutes on each side. 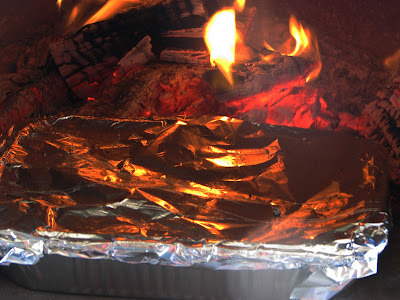 We removed our meat from the fire, covered with foil and let rest for 10 minutes. It turned out to be cooked a perfect degree of rare. Surprisingly there was no ash sticking to the meat. You can use a brush to clean up the meat a little if so desired. 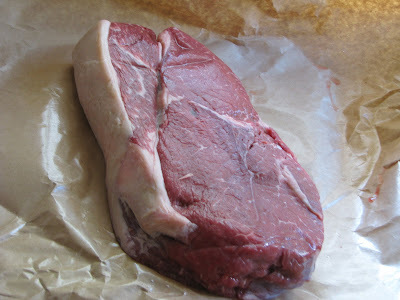 Our meat was sliced thinly and it was so juicy and tender. The taste was phenomenal. The outer crust protected a tender interior. The crust had a taste that has to be experienced.There were barbeque flavors that cannot be duplicated on the grill. I think our caveman forefathers were on to something. LAWRENCE'S WALNUT CREEK MEAT CO.
We have a hankerin for some protein. It cannot just be any cut of meat. It has to be acquired from a ‘Meat Adventure’. This will be no problem, because, It is what we do. 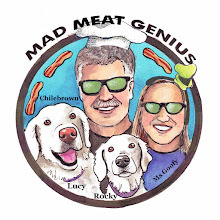 ‘Lawrence’s Walnut Creek Meat Co” will be logged into the ‘Mad Meat GPS’. 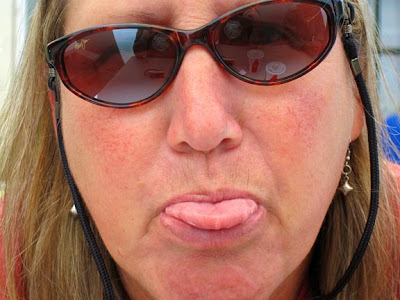 Ms. Goofy will fire up the Formula-one racing Honda and we will strap ourselves in for a wild Meat Adventure. Now Lawrence’s is not actually in Walnut Creek. They are located in the tony town of Alamo. This family run meat market has been around since 1887 claims the neon sign. The sidewalks of Alamo are paved with good intentions and trendy shops of perpetual spending indulgence. This meat market caters to the clientele of enlightened Meat purchasers. 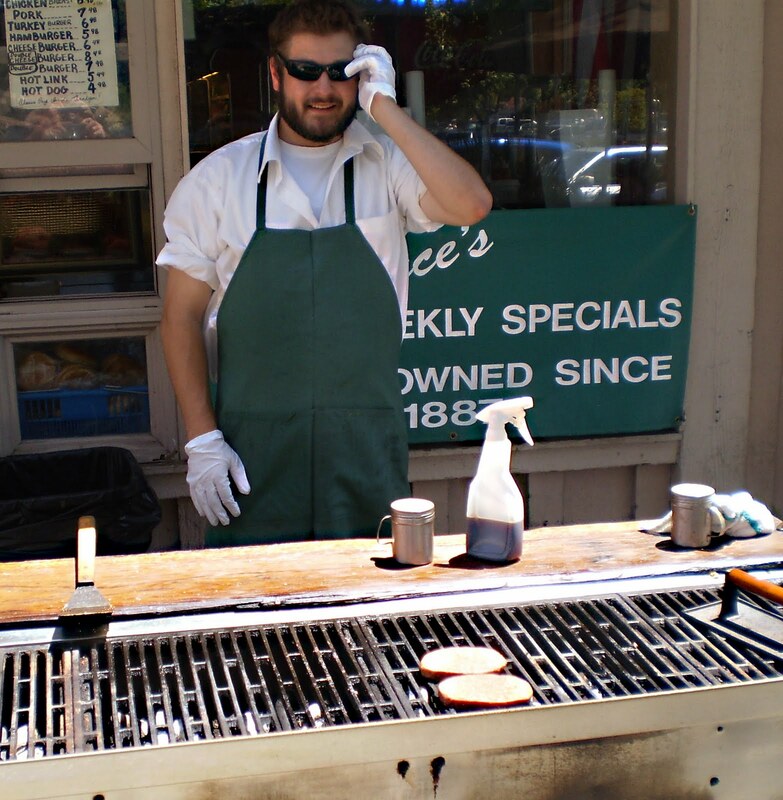 Lawrence’s sells premium meats, chicken, sausage, deli meats and they have an outside grill to prepare your lunch desires. We walked in and surveyed the premise. It was neat and very well organized. We were greeted like the dignitaries that we are?? There are a couple of house made sausages , pastrami, and most of the meat are from premium meat distributors. The selection is wonderful. We took a couple of laps around the display refrigerators and found a Chateaubriand cut of beef that caught our fancy. 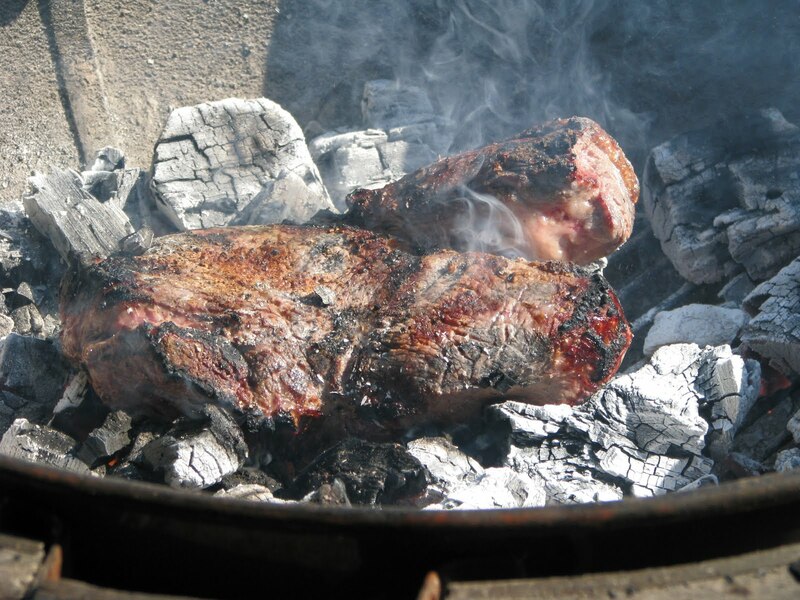 This would be our meat of choice for today. 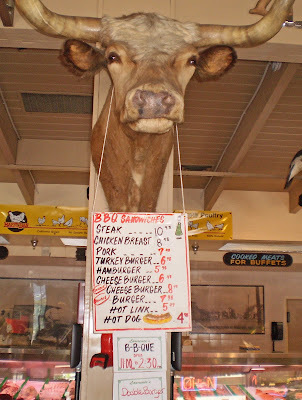 “Lawrence’s” is a wonderful place to buy meat if you live in the Alamo area. It is a great place to have a grilled lunch and take home a steak for dinner. The staff was very nice except they were bacon knowledge challenged on the two Bacon's that they did carry. (This is my only beef or negative charge). Lawrences's Walnut Creek Meat Co.
Stay tuned for the Fire episode!!!!!!!!!!!! Ms. Goofy is a good driver but sometimes she has a lead paw. 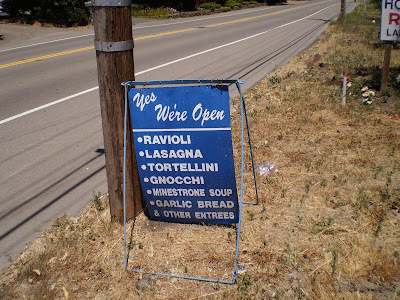 We were speeding, 26 miles per hour through a residential neighborhood of Pleasant Hill when we spied a sign proclaiming ‘We are open’. Ms. Goofy pulled the emergency brake and the car spun in a semi circle. She let off on the brake and proceeded to spin the tires and pulled the brake one more time. We ended up parked perfectly in front of Molino’s It scared the ravioli right out of me. Well it did not happen exactly that way. 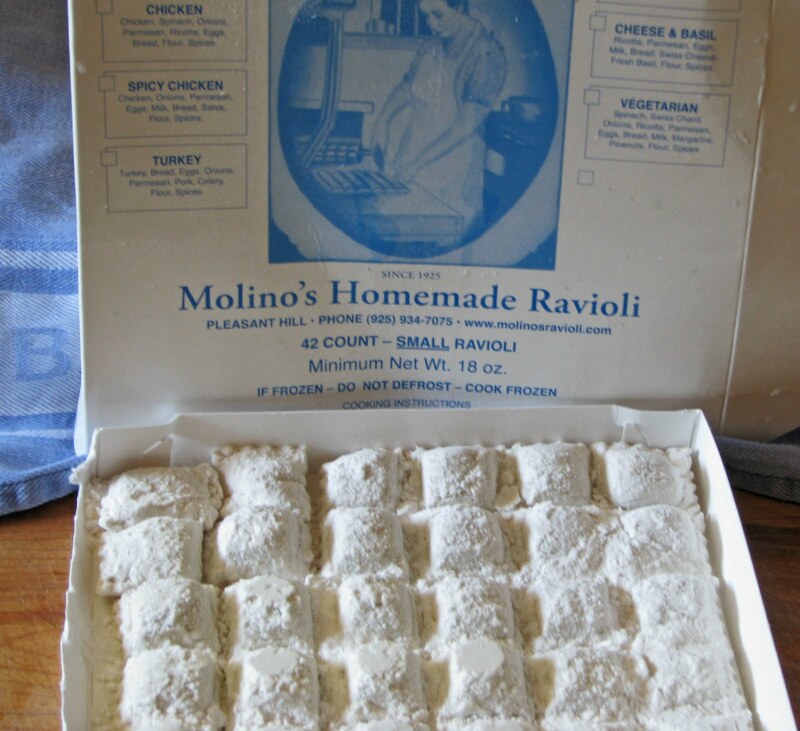 Molino’s is wonderful food find. 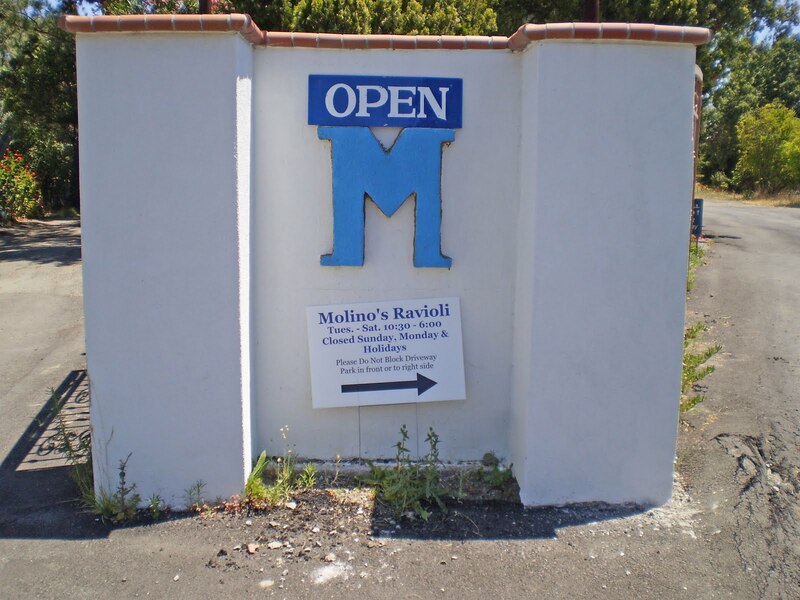 Molino’s Ravioli is a commercial kitchen located in the bottom of an old house that makes and sells great Italian food. Their specialties are pasta, raviolis, soups and Italian gravy. (Sauce). We have been making special trips to this destination for the last 10 years. This is a local food destination which is not the easiest place to find. 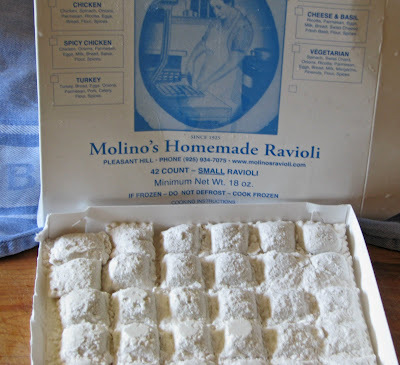 Molino’s does not do a lot of advertising and word of mouth is how we happened across this food discovery. When you arrive and walk through the door, a heavenly aroma of an Italian Grandmother’s family kitchen welcomes you. This extremely intoxicating smell is of the sauces that have been simmering in huge pots for hours. This bouquet of aroma may bring to sing, Dean Martins ‘That’s Amore’. Well at least I did. The kitchen is open to view the ravioli making process. 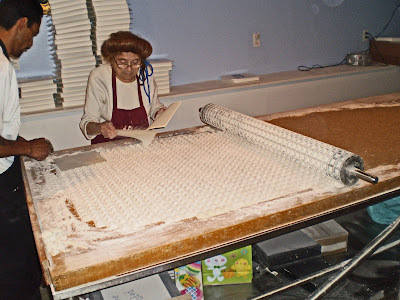 This is a hands on process. You can feel the love radiating from these pasta’s and sauces. They have several refrigerators to make your choice of products to go. Choosing between, beef, chicken, turkey, sweet potato, butternut squash, portabella mushroom, vegetable, and cheese fillings can be perplexing. Be sure to check out the ‘ravioli of the week’ special. A bunch of wonderful heat and serve meals are available such as; Cannelloni, lasagna, meatballs and so much more. 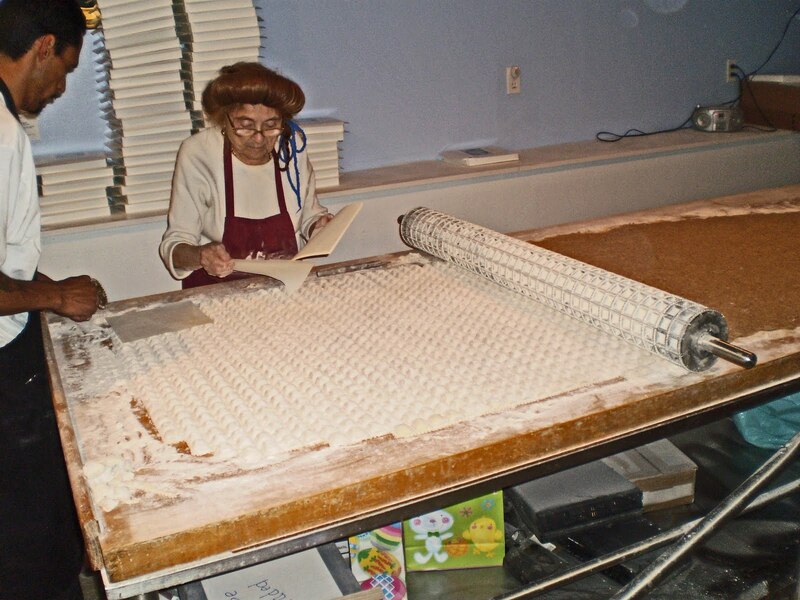 We picked up several ravioli boxes and returned to Ms. Goofy’s formula-one race Honda. We made it home safe, barely. Did I tell you Ms. Goofy is a good driver? We put some water on to boil. Some of last years harvest sauce was extracted from the Chilebrown Ice Cave. It takes no time at all to cook the ravioli. The sauce was added and we enjoyed some home made treats. 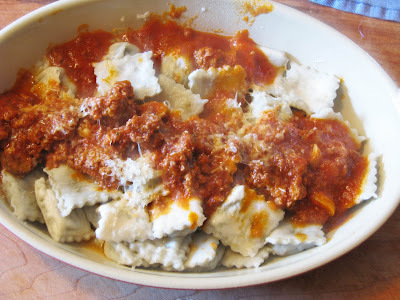 These raviolis are plump meat pillows of joy. They were so good I broke out into song once again. WaaaaHoooo! 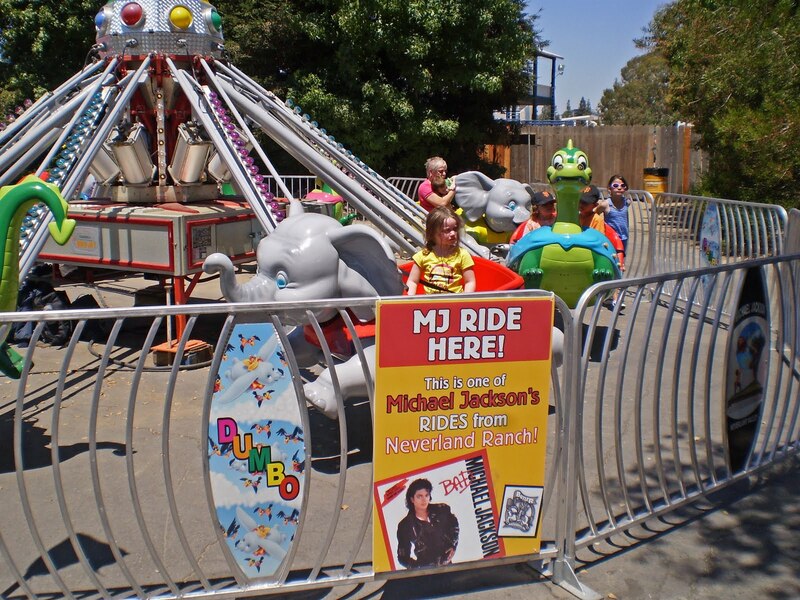 We found it at the Alameda County Fair. We found chocolate covered bacon on a stick. It was just as good as it sounds. It was chewy, salty and best of all a chocolate delight. 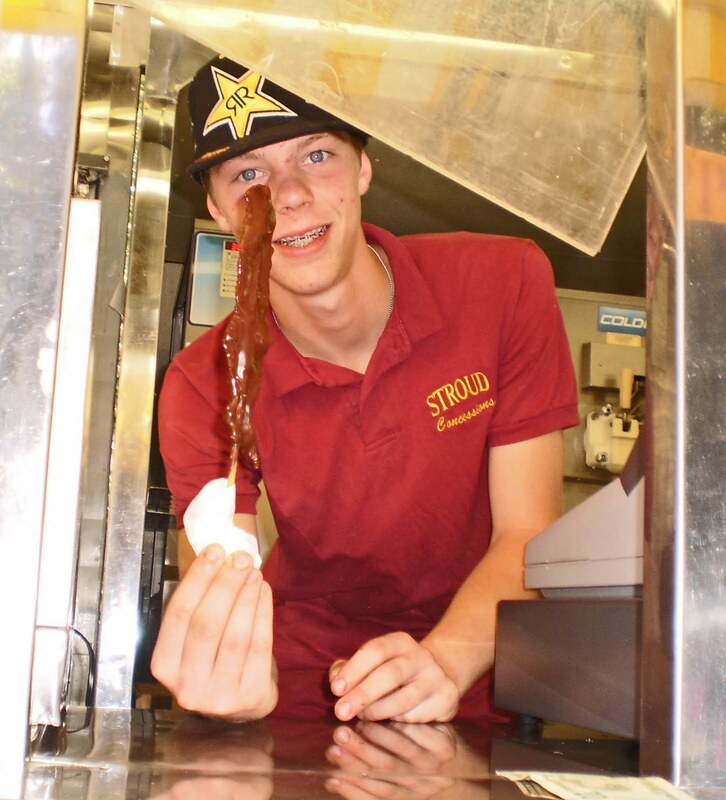 The chocolate bacon was skewered on a stick for easy consumption. The Alameda County fair is an old fashioned summer fun event. The amount of different and so unhealthy foods that were offered for sale was staggering. We were in fair food heaven. 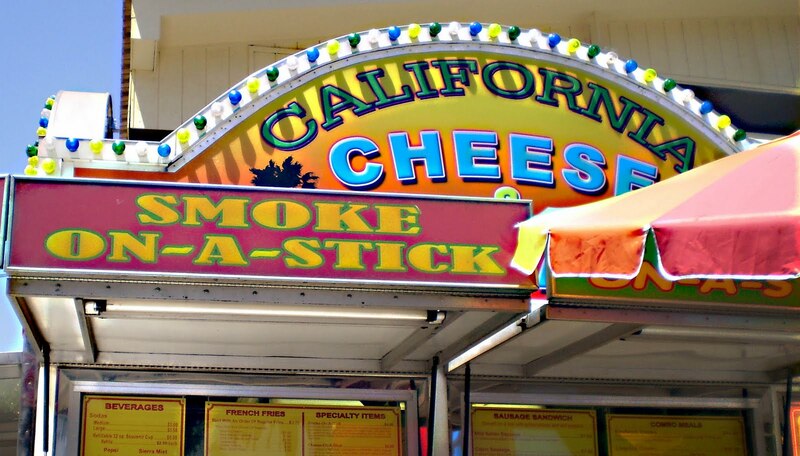 We never did find out what 'Smoke On -A -Stick' was. We also wondered if 'Big Bubba's BBQ' was really that bad? We took some pictures and strolled through out the fair. We found a temporary tattoo artist that left a semi-lasting impression on Ms. Goofy's ankle. 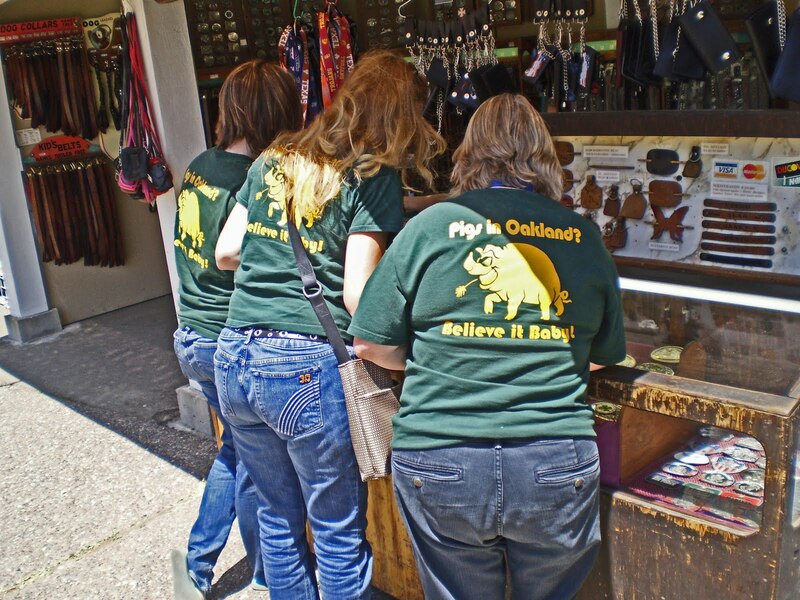 We stopped by the 4-H pavilion and ran into a group from the 'Oakland Swine Project'. We took a gander at some livestock and decided it was time to watch the ponies run. 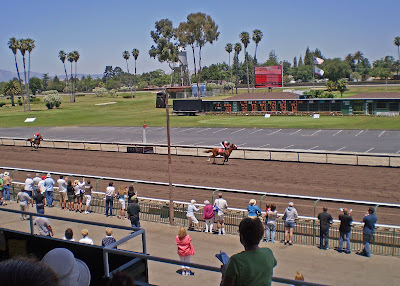 It was time to hit the track a try our luck. 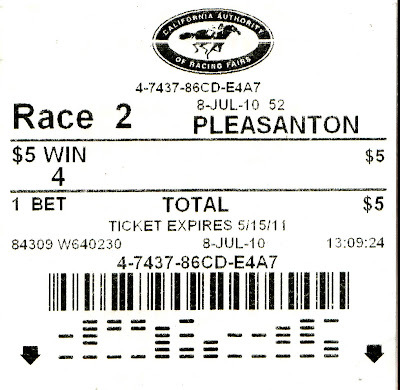 I just wanted to show you what a losing ticket looks like. 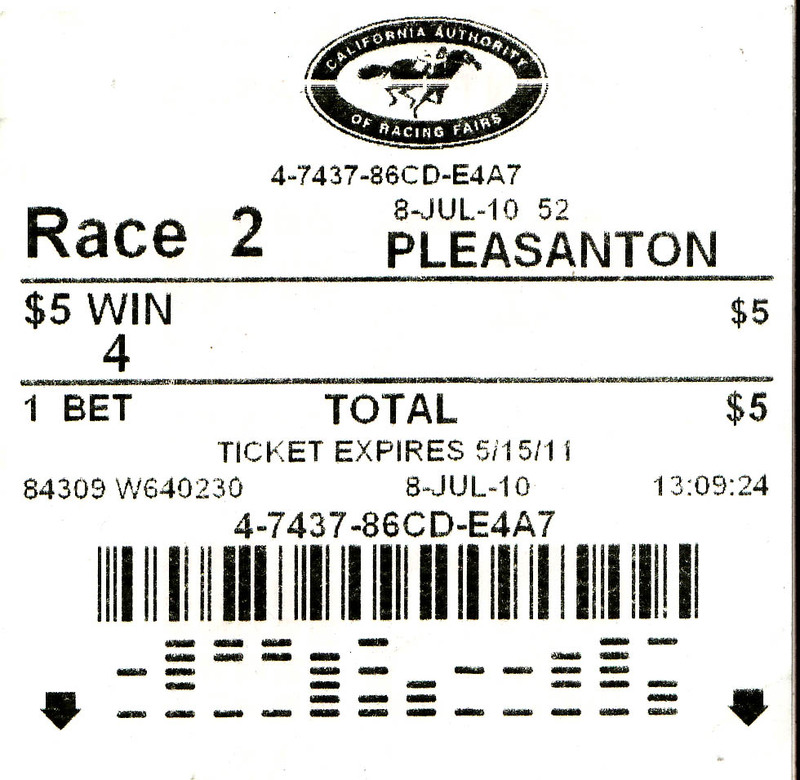 My horse did not finish last but very close. 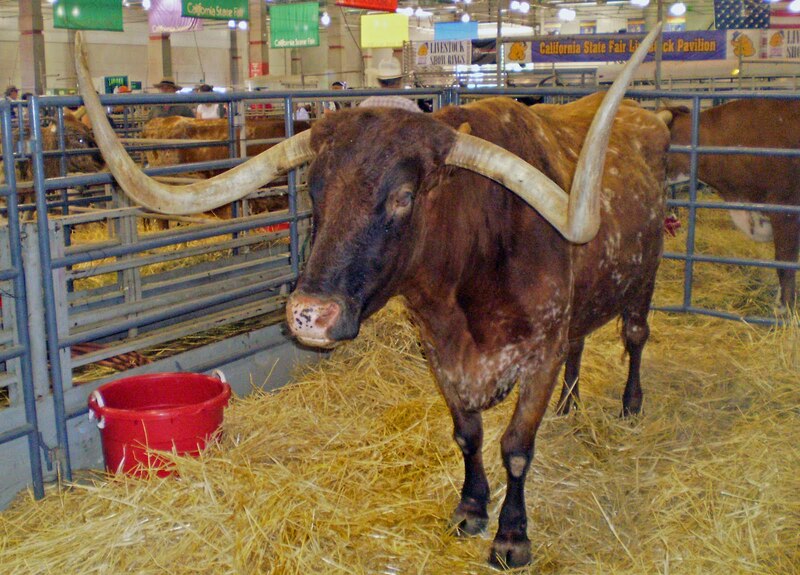 We did not feel like losers because of our great day at the fair. 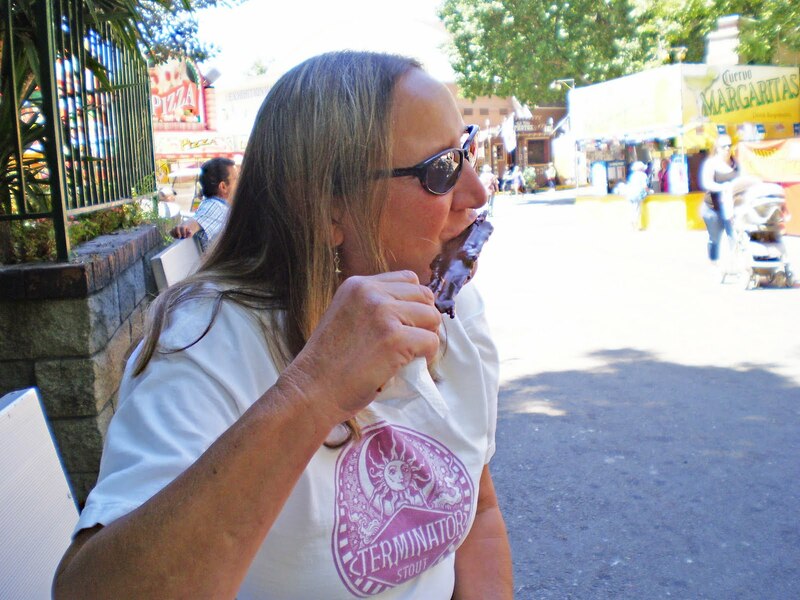 The chocolate covered bacon on a stick was a winning ticket in our book!